DAMPICIDE is a combination of Minerals specially prepared to regulate the Moisture in Pianos, Organs, Electrical Generators, etc. The great enemy of a piano is dampness which causes the action to become sluggish and often the keys to stick, the strings and tuning pins to rust. If the keys rattle in winter it is certain that the piano was too damp in summer, causing shrinkage of action when dried out. 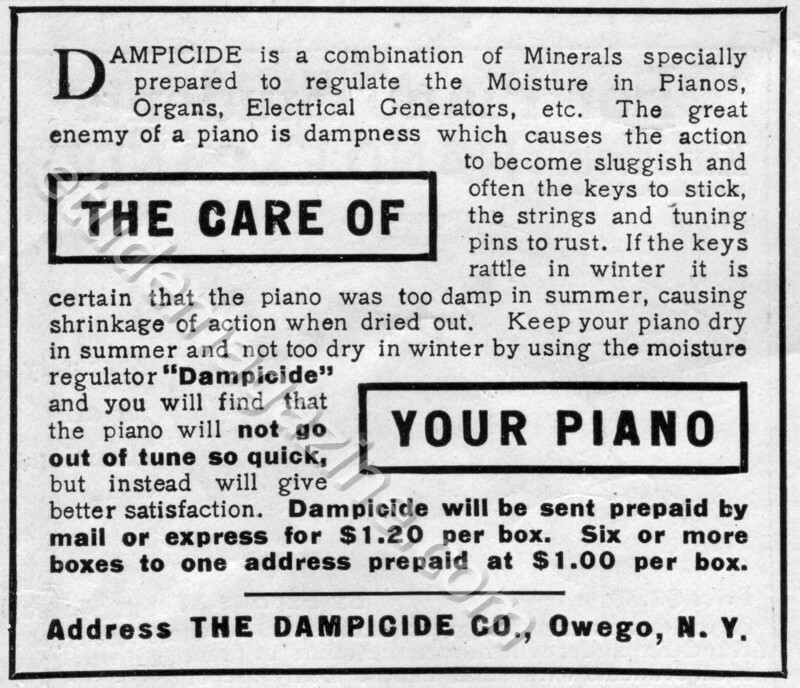 Keep your piano dry in summer and not too dry in winter by using the moisture regulator “Dampicide” and you will find that the piano will not go out of tune so quick, but instead will give better satisfaction. Dampicide will be sent prepaid by mail or express for $1.20 per box. Six or more boxes to one address prepaid at $1.00 per box. Address THE DAMPICIDE CO., Owego, N. V.